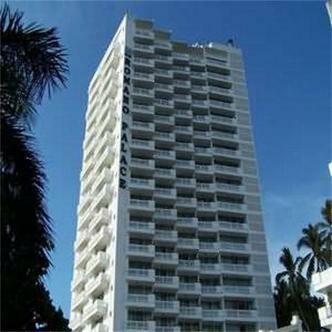 The Romano Palace Hotel in front of Condesa Beach, 10 minutes drive from the convention center, in the best tourist and services area of Acapulco, recently renewed in all public and service areas also redecorated in their rooms private terraces all with ocean view, 2 double beds for 4 people, air conditioning, color cable tv, free parking, pool and kids pool, italian specialties restaurant, coffee shop, beach club for all guests of the hotel, kids club, lobby bar with live music, on season only December to April. Meeting banquet facilities for up to 200 people. Beach Club located at Condosa Beach, across the Avenue in front of the hotel. Towels service, palapas, beverage to our all-inclusive guests, open from 9am to 5pm. Reservations manditory at front desk, the hotel offers ocean front rooms with air conditioning, color cable tv, a swimming pool, restaurants, bar, safety deposit boxes, travel agency, car rental desk, free parking, a tobacco shop, room service and meeting rooms.